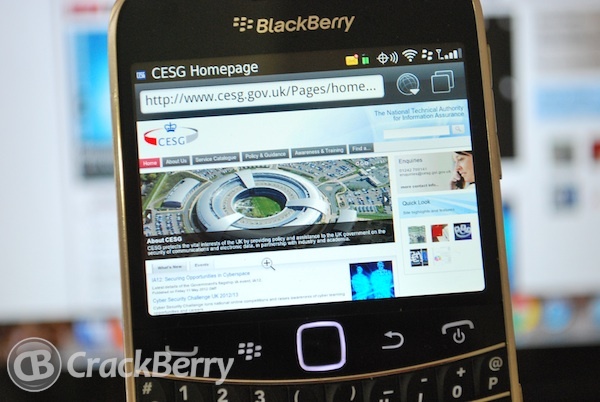 LONDON, UNITED KINGDOM--(Marketwire - May 17, 2012) - Research In Motion (RIM) (NASDAQ:RIMM)(TSX:RIM) today announced that CESG, the National Technical Authority for Information Assurance in the UK, has approved the BlackBerry® 7 operating system for government use. The approval enables public sector workers to utilise the enhanced performance and rich functionality of the latest BlackBerry smartphones available in the UK. The BlackBerry® Enterprise Solution from RIM is the only mobile solution approved by CESG to protect material classified up to and including 'Restricted'. BlackBerry smartphones currently available in the UK and covered by the new approval from CESG include the BlackBerry® BoldTM 9900, BlackBerry Bold 9790, BlackBerry® TorchTM 9810, BlackBerry Torch 9860, BlackBerry® CurveTM 9360 and BlackBerry Curve 9380.